Fewer central IT execs see security as a significant challenge to moving workloads to the cloud but that’s come with more business managers agreeing IT should be the cloud middleman. The days of business units sneaking around the IT department to buy cloud services may be coming to an end, with growing consensus that IT should be shepherding business units in their move toward the cloud. That’s according to the 2015 State of the Cloud Report by cloud management firm, RightScale, which found that 40 percent of respondents from a business unit saw central IT as the broker for cloud services, matching the view from respondents who reported working in central IT. Last year just 18 percent in a business unit believed central IT should be their guide for cloud services. IT respondents consistently believed it should be the broker. RightScale’s report included responses from 930 technical executives, managers, practitioners from across the globe, with a third coming from organisations with greater than 1000 employees and the remainder from SMBs with fewer than 1000 staff. While the business attitudes may have moved closer to central IT on cloud brokering, central IT has become more relaxed about cloud computing. Last year 47 percent of respondents from central IT saw cloud security as a significant challenge, which fell to 41 percent in 2015. That coincided with jump among central IT respondents who reported public cloud as a top priority, rising 10 percentage points to 28 percent. Despite wide agreement that central IT should play a brokering role, there’s still a tussle over ultimate control. 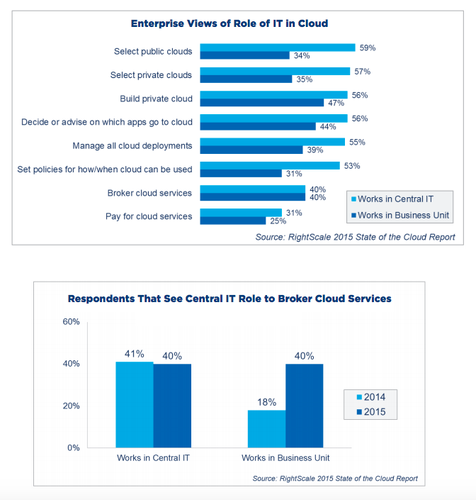 For example, 59 percent from central IT believe they should select the public cloud provider, while 34 percent from business believe central IT should — a split that was borne out on other matters, including who gets to select private clouds, who manages cloud deployments and policies, and how and when a cloud service is used. RightScale also broke down top concerns among companies at different stages of maturity in the cloud. The top challenge for the most mature or “cloud focussed” was security at 19 percent, closely followed by compliance at 18 percent. For mid-stage cloud users, building a private cloud was the top challenge at 32 percent, while for beginners, a lack of resources and expertise at 35 percent was the top challenge. And while cloud security give fewer IT execs heart palpitations these days, security remains the single biggest concern overall with 28 percent of respondents registering it as a significant challenge. However, where as last year only 17 percent cited skills and resources as a significant worry, this year 27 percent said this was a significant concern, making a lack of skills as big a concern as security. Among both SMBs and enterprise, Amazon Web Services (AWS) remains the leader by a long mile for customers that are running apps in a public cloud, with 57 percent of respondents claiming to run apps on AWS, followed by 12 percent for Azure IaaS, 11 percent for Rackspace public cloud, nine percent for Azure PaaS, eight percent for Google App Engine, and 5 percent a piece for Google IaaS, VMware vCloud Air, and IBM Soft Layer. However, Microsoft’s Azure IaaS has made significant inroads to enterprise public cloud usage, with 19 percent of respondents saying they run applications in Azure this year compared with 11 percent last year. AWS was flat by contrast, with 50 percent this year compared to 49 percent last year. Rackspace edged up to 10 percent.